IMG_0998, originally uploaded by All Things Mimi. I rinsed two cups of sushi rice (several times) until rinse water ran almost clear. I put it in a heavy sauce pan with 2 1/2 cups of water (just enough to cover the rice) and put it on high heat to boil. After it reached the boiling point, I turned it down to a simmer and let it go about 20 minutes. Meanwhile, in a small saucepan, I put 1/3 cup of rice wine vinegar, 2 tablespoons of sugar and 1 teaspoon of salt over very low heat, just until the sugar and salt dissolved. I then put it in the freezer to cool a little. 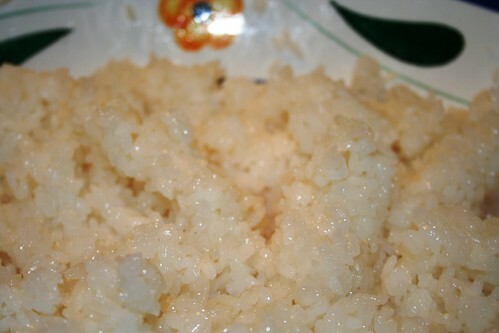 I transfered the rice to a large bowl and had Dev fan it while I cut the rice wine vinegar mixture into it.